Barley has a knack for spotting potential where others see rubbish. In the old clothes the rest of us shove into big bags, the punctured tyre liners, even the derelict market streets that have lost their charm. For the founder of Fabrications, life is about transformation. When she first came to Broadway Market in the late 90s, the street was run-down and most of the shopfronts boarded up. A far cry from its forgotten glory days of the mid-century, and indeed from its present popularity. But it was that combination of history and unexplored potential that enticed Barley to set up shop here at the heart of one of London’s most creative areas. Fabrications is a maker’s oasis. Upstairs is the original shop that was opened in the early 2000s and which soon became a hub for the local artists and craftspeople, and downstairs the renovated workshop where talented teachers run clubs and classes. Locals are known to stop in for a yarn (and perhaps to buy some yarn, too) or to seek out advice on their projects. 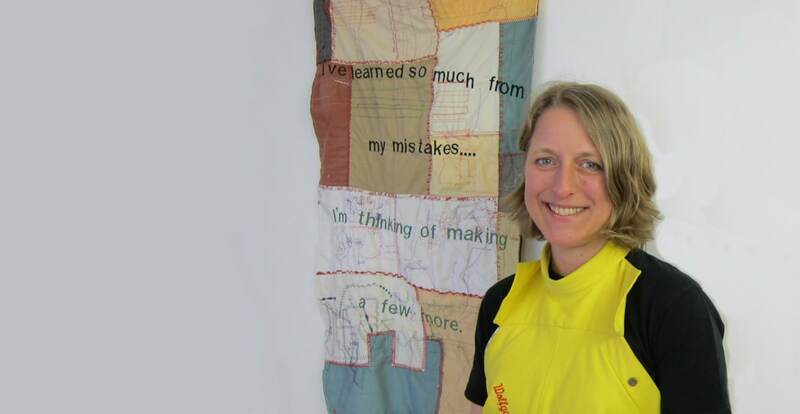 When I went to visit her in East London for my first sewing lesson, Barley shared a story about a woman called Lucy, who once walked into the shop with a yellow suitcase. The suitcase was full of shirts that had belonged to her late husband who’d passed away a couple of years earlier. Her request? An upcycling commission (Fabrications had earned a reputation for these) like none they’d ever taken on before; Lucy wanted to have a set of memorial cushions made up from her loved one’s old, worn fabrics for herself and her children. And so was born a sweet service that Fabrications now calls ‘Remember Me’, through which Barley transforms clothes and other items that hold memories of people and times gone by. It’s almost a therapeutic process because even if her clients don’t have the skills to contribute to the project themselves, they’ll be drawn into a conversation about their cherished memories. Around the time that upcycling projects like this were taking off at Fabrications, there was still a lot of stigma surrounding the use of second-hand clothes and recycled materials. Especially coming out of the 90s, when a wave of aspirational design and trend-obsession drove everyone to focus on brand names and fast-fashion rather than self-expression. I confess – even today – to feeling a little daunted about diving into the world of upcycling and thrift shopping. But Barley tells me you can’t change the world without changing yourself and – without sounding preachy – puts forward a compelling argument for how we can reduce waste by embracing creativity. In the face of resistance from the masses, it was a natural – if somewhat accidental – evolution that led Barley to find her niche here in the realm of regeneration. In the early days, upcycling was born of necessity – as many things are when you start to work on your passion. With a limited budget, she made the most of a friend’s scrap heap from a local bike shop and wove cushions and fabrics from punctured tyre liners. Soon the focus had widened into a general passion for building her dream business with sustainability in mind, and spreading an awareness of the clothing production process, waste, and opportunities to change our habits. As the Broadway Market vibe has become less about a tight-knit community of creative souls and more of an attraction in and of itself (#gentrification), Barley’s adapted by giving those artists who do share her passion a place to connect with each other. It’s when we’re exploring our creativity that we really get to know each other. We’re more open when we’re being creative, when we’re learning. Towards the end of our chat – when we started getting into philosophy – I asked if creativity is something that can be taught. It’s one of those things that we often see as black and white – you’re either a creative person or you’re not. But without a moment’s hesitation, Barley told me that everyone’s creative, it’s just a matter of drawing it out. And that’s why she loves teaching. You might not directly ‘learn creativity’ in a sewing class, but getting the practical skills down gives you the confidence that you can take anything and turn it into whatever you want. It gives you the space to be inspired. From there, it all comes down to passion. Barley’s attitude is very much ‘where there’s a will, there’s a way’ and that rolls into her business just as it does into her craft. All of the tough days, the struggles, the hours of boring accounting and admin, she gets through that because it’s what allows her to share her passion for transformation with the world. And that’s why it’s so important to take the time to explore your creativity and get to know yourself. When you’re really connected to what you’re doing, it all feels worth it.